That realization came to me while having lunch with a friend recently. As we enjoyed our sandwiches (corned beef for him; tuna for me, in case you’re wondering), he began recounting the number of interruptions and requests for information he’d received already that morning. “I spend so much time responding to people that I don’t have enough time to do my job,” he despaired. Unwittingly, perhaps, my friend stumbled upon one of the paradoxes of modern-day collaboration. While great new technologies make collaborating with coworkers easier than ever, we’re doing it less efficiently than ever. It would be easy to blame the technology for this, but I think that’s misguided. Some of the explanation lies in our current organizational structures. Flatter org. charts that are meant to drive quicker decision making are pushing the need for alignment and coordination to all levels of the company. And when you toss in the “need-it-now” mindset that comes with having to make snap decisions, you have a recipe for inefficient collaboration. Half of Your Workday… Gone! This inefficiency comes at a steep cost. 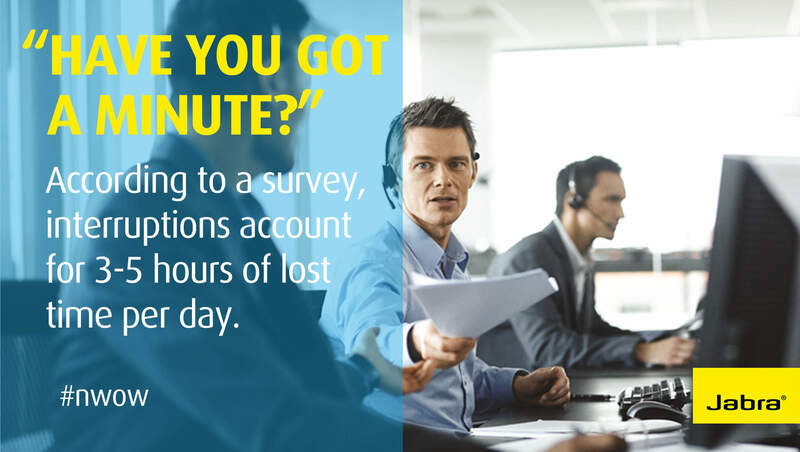 In one study, employees claimed that time lost to interruptions accounted for 40% to 60% of their day. That’s between 3 and 5 hours every day! Factor in the loss of momentum caused by the initial distraction, and the time needed to restart, and you’re talking serious time and Money. Interruptions also sap morale and damage job performance. In a recent Jabra survey, 43% of workers cited that interruptions from colleagues affecting their job performance negatively. Begin building a truly collaborative culture. We need to develop norms that guide when and how to communicate and collaborate for maximum value and minimal intrusion. Building a truly collaborative culture begins with establishing trust among coworkers, recognizing that others’ time is as valuable as our own and taking responsibility for our actions. Articulating shared social norms around how we behave and use technology is similarly critical. Another step on the path to a collaborative culture is easy: If you don’t want people to interrupt you, don’t interrupt them. Be respectful of “do not disturb” statuses or busy lights. With today’s option to turn off email notifications, a polite message that says, “I can see you’re busy, but I have a request. Please let me know when you have a few minutes to talk” goes a long way. Of course, a new culture won’t spring up overnight. In the meantime, make a practice of carving out time to devote to important tasks that demand your energy and attention. Set your presence status to “busy” or “do not disturb.” In some cases, you may need to politely explain why you’ve done so and let would-be interrupters know how and when you will get back to them. Our jobs are stressful enough without the added burden of continual interruptions. Let’s take a stand—and take back our time. Stress will kill you – if you think it will!